"We have peace in the household again. listen to what’s being said." 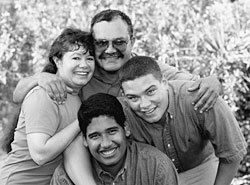 In 1978, the Washington State Legislature created FRS, recognizing that families in conflict have a need for services, and that parents, courts, and law enforcement need tools to prevent the costs associated with foster care and juvenile justice system involvement. Although the intent of the services has not changed, the name has changed to Crisis Family Intervention Services (CFI). CFI provides a maximum of 12 hours of in-home counseling during a 45 day period. The therapist meets with the family within 72 hours of referral and appointments are scheduled at times convenient for the family. The goals of CFI are to resolve the immediate crisis that precipitated the referral and to teach skills to family members to address recurring areas of conflict. Adolescents 13 through 17 years of age and their families are served through CFI. At risk youth, children in need of supervision, and families in conflict are eligible to participate in CFI, and are referred by state child welfare social workers. Sixteen-year-old Katie, her mother Susan, and stepfather Tom, were referred for (CFI) at IFD after a physical altercation between Tom and Katie. Apparently they were arguing and wrestling with one another when Tom pushed Katie into the dishwasher, resulting in a bruise on her back. Katie told a friend about the incident, who then spoke to the school counselor. The school counselor made a report to Child Protective Services (CPS) at the Division of Children and Family Services (DCFS), and the family was transferred to the adolescent unit within the same organization. A referral was subsequently made for CFI at the Institute for Family Development. The DCFS social worker identified the family’s major problem as ongoing and escalating conflict between Katie and Tom. The IFD therapist listened to family members’ perspectives, learning that Tom yelled often at family members and seemed to have high expectations of himself and others. Communication among family members had broken down because Susan, Katie and her younger sister, Yvonne, were afraid to talk with Tom. The CFI intervention focused on anger and stress management for Tom, who expressed concern that the intensity of his emotions was causing his increasing health problems. The therapist taught rules of fair fighting and impulse control skills to family members, emphasizing methods they could use to avoid lashing out at each other. Conflict resolution skills were taught to family members. They learned negotiation skills that they used to resolve issues regarding Katie’s free time. At the end of the intervention Tom reported that he had "learned to control his temper and find a peaceful way to deal with problems." He also stated that he had learned to "listen to the other person before reacting." Katie was earning more free time with friends by demonstrating responsible behavior at home and at school. Susan stated that the intervention helped the parents to "better cope with the problems of having a teenager." "The program benefited everyone, and opened our eyes to better handle anger."